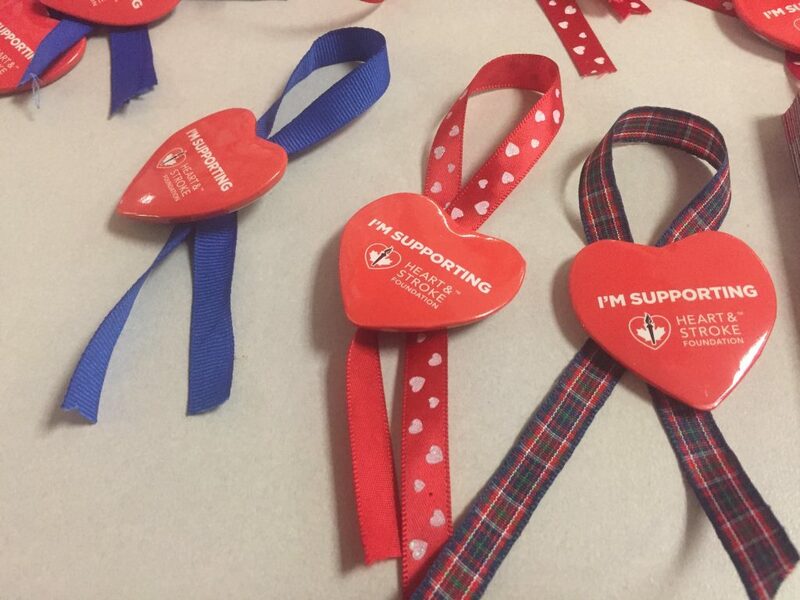 Ribbons from the “wear your heart on your sleeve” campaign created by the Heart and Stroke Foundation to raise money for the Cassibo family. Photo by Callie Jackson, QNet News. BELLEVILLE – The Heart and Stroke Foundation and Loyalist College partnered up to paint the night red on Friday. The men’s and women’s basketball teams played the George Brown Huskies while the Heart and Stroke set and Loyalist College raised money for the Cassibo family of Belleville. The father of Erin and Kayla Cassibo, both Loyalist athletes, suffered a debilitating stroke a year ago. Hoskin also said the fundraiser has been in motion for a while. The foundation set up a fundraising table with the proceeds going to the Cassibo family. At the table, items including tuques, soccer balls and basketballs with the heart and stroke logo on them, as well as college clothing, were being sold. Business members in the community made generous donations to the cause, said Sandra Barnes, area co-ordinator for the Heart and Stroke Foundation.